The String-Charger is attached to the bottom end of the fingerboard underneath the strings. 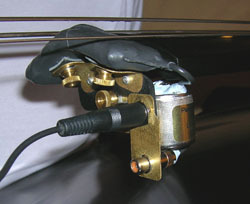 The coil can be bend to match the fingerboard curvature. I have a Pierre Josephs “Dreambox” that was purchased a number of years ago. (I also have a stringcharger/bridgecharger.) The “Dreambox” now does not work. Can’t get any bass response from it. Do you repair “Dreamboxes.” If so, I’ll send it to you with a money order up front. Please let me know. Thank you very much. Hi: Check if the coil is not “open”. You can do it with an ohmmeter or multimeter. If the wire is broken, the coil has to be substituted. I made my own magnetic pickups for double bass. Hi, I need to know if you have a magnetic pickup for a five-string upright bass, thanks and hope answer.